The Washington State University Master Food Preserver (MFP) program is a VOLUNTEER program which trains volunteers to assist and work with the community year-round. Do you want to learn about preserving food safely, but are not ready for the volunteer commitment? WSU offers a wide variety of educational programs including “Preserve the Taste of Summer” online course, “You Can!” Food Preservation and specialty classes such as How to Preserve Fish & Seafood and How to Preserve Wild Game to meet the needs of the general public. If you enjoy volunteering, like helping others, want to learn more about food preservation/food safety and are willing to share your knowledge with the community then the Master Food Preserver Program may be the right fit for you! Do you have the following qualities? Have a desire to volunteer, learn and share knowledge. Have an interest in food safety and food preservation. What is a Master Food Preserver? 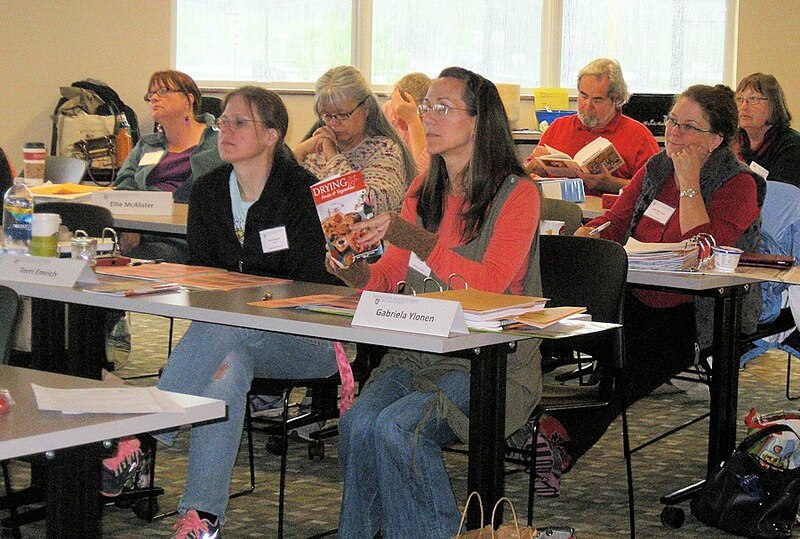 The Master Food Preservers (MFP) are a group of highly dedicated and trained individuals who volunteer in Clark and Cowlitz county providing information about food preservation and safety. We do a wide variety of tasks including the Food Safety helpline, developing and staffing displays at community events, testing pressure canning gauges, teaching/assisting in community classes and more. MFP’s volunteer year-round with the majority of events occurring in Clark county and between the months of June thru September, usually on weekends with some weekday events. The initial step to becoming a MFP is to complete the Master Food Preserver 2019 Application and submit with payment of $225. Mail or drop off the application at Heritage Farm/WSU Clark County Extension @ 1919 NE 78th Street, Vancouver, WA 98665 with a $225 check made out to WSU (please note that your check will not be cashed until classes start). If we do not have our application online yet please email or call 564-397-5700. You will attend an orientation classes. Submit your application and we will let you know if we still have openings available. The MFP program has a limited class size due to the in-depth study and labs that are required for the program. The program has only one class per year. In-depth study of food safety and specific procedures in food handling, preparation and preservation. Update on food safety, food preservation and equipment. Safe and correct food preservation methods. Hands on canning sessions each week. Course fee covers notebook, literature/booklets and supplies. You will attend 6 full day and one half day Friday sessions (50+ hours) over a seven week period that includes actual hands-on canning experiences. The last class is a wrap up of information and luncheon potluck. Upon completion of the course and passing a written exam** you will become a WSU MFP Intern and will get to start participating in our many exiciting & varied activities held throughout the year. During your 50* hour internship (50 hours volunteer time) you will be required to participate in a variety of events such as the Food Safety Hotline, Pressure Gauge Clinics, Clark County Fair, helping with our general public classes and more. Upon completion of your 50* hour internship (1st year), you will become a fully fledged WSU MFP Volunteer. You are then required to do the yearly re-certification test**, 40* hours volunteer serve and 10 hours of continuing education. * All volunteer hours include driving time to and from events within the boundaries of Cowlitz and Clark counties. It is very easy to achieve the required hours to remain active in the program. **All exams and/or tests are open book. Serve as a resource person in the county to answer food preservation questions. Develop and staff displays at community events. Answering consumer questions on the Food Safety Helpline and community events. Test pressure canning gauges at clinics and/or events. Teach or assist in teaching community classes. Serve as a team member with WSU Extension Faculty and other volunteers in sharing food safety and preservation information from researched recommendations that provide safely preserved food. You will continue to receive the most current and updated information on the latest food preservation/safety research and all new publications as long as you maintain your active status in the program. Sit in on new MFP classes and all MFP community classes at no charge. Join a committee and make a difference. Home phone and/or cell phone. Computer and/or smart phone with reliable internet access and a valid email address. Food Safety Helpline is done from the convenience of your home. All volunteer activity sign-ups, reporting of hours and additional food preservation/food safety references are online. Monthly newsletter and other correspondence are received via email. When you join the MFP program you are committing to attend a 7-week long 50+ hour course of training to become a MFP volunteer and passing your final exam. You are asked to serve a minimum of 50* hours (1st year), and as a veteran 40* volunteer hours and 10 hours of continuing education. Your initial commitment is for one year but we actively seek out individuals who will commit to remain active in the program beyond the initial year of service. The yearly commitment to the program to remain a Master Food Preserver after the first year is a re-certification test**. 40* volunteer hours and 10 hours of continuing education. *All volunteer hours include driving time to and from events within the boundaries of Cowlitz and Clark counties. It is very easy to achieve the required hours to remain active in the program. **All exams and/or tests are open book. Why do we ask you to stay in the program for an extended period of time? Due to the nature of our training and class size restrictions we train a small volume of volunteers each year. Our ranks grow slowly but surely with volunteers who truly have a passion not only for volunteering but for ongoing food preservation outreach to the community. As a member of the MFP program you will be able to enjoy the camaraderie of people who share common interests, you can also develop friendships, enjoy social opportunities, and continue enriching your life and those around you with the continuing educational updates/opportunities. We have an annual Recognition Reception with special awards and prizes to acknowledge the work that is done by our committed group of MFP volunteers. Who are the MFP’s ?